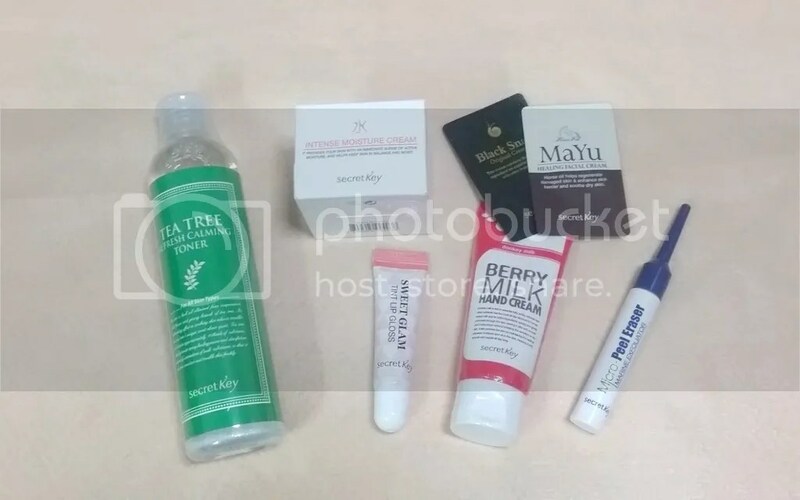 I recently chanced upon this super great deal on Qoo10 for a “secret box” from Secret Key, a korean beauty brand, for S$15.90 – and I just couldn’t let it go pass! I had no idea what was in the box; there were 4 choices but the “water” version seems to be the least picked so there wasn’t any reviews for the water box that I could check before making the purchase but at SGD15.90 and another few bucks for shipping for Korea, it was definitely worth a try! I actually have a ton of toners in my ginormous beauty stash right now; but I also run through toners pretty quickly, so I’m pretty happy to get this! I didn’t want to open this because I have too many face creams in my beauty stash; this looks like a light-orange thick cream. I will probably pass this off to my mum. I have no idea what the name of this shade is but this is really pretty orange lip gloss – I’m not usually a fan of orange lip glosses on me, but somehow I kind of like how this swatches so this is going into my bag this week for more testing. Due to my years of beauty box subscriptions, I have so many hand creams now that I can fill a whole bath tub with what I have and still have left over so I’m usually not happy about receiving hand creams. It has nothing to do with how good this is; this is going to a friend. Erm I have no idea what this is and how to use it – there are no explanation cards in the box. I suppose it’s an exfoliator? I’ll google it a little more later when I’m up trying this. Just a couple of extra sachets of samples. So that’s it! I think for a box that cost SGD15.90, this is wonderful value. There are 5 full size items; any one of them would easily make up half the value of the box. It is skincare heavy but I already knew that before purchasing it as there was another makeup only box that I was hemming and hawing over but ended up not buying. I think in all, this is a wonderful box and even if you don’t end up wanting to use everything in it, since the holiday season is coming, some of the items would make great gifts!